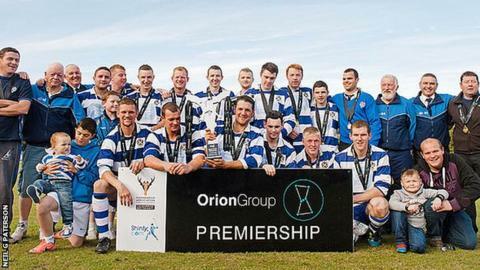 Newtonmore are Orion Premiership champions for the third consecutive year following a 2-0 win over Glenurquhart in their final game at Drumnadrochit. This means that the only other possible contenders Kyles can no longer top the table irrespective of how they get on in their final outing against Inveraray next Saturday, in what will be a rematch of the Scottish Hydro Camanachd Cup final. And Lochaber are on the threshold of the North Division 1 title and a Premiership place following a 3-0 home win over Skye. Danny MacRae and Chris Sellar both scored for Newtonmore in the first 20 minutes to ensure that the game was followed by Camanachd Association President Archie Robertson handing over the trophy and medals to the Badenoch side. This was also Newtonmore manager Norman MacArthur's final match in chanrge since he's now standing down along with his backroom team. MacArthur ended a 25-year wait for the title in 2010 and bows out with three-in-a-row. This is the last major honour of what has possibly been shinty's most open season ever, with four different clubs in the two national senior finals, the Camanachd and the Macaulay, while a fifth - Newtonmore - have won the Premier League. This represents a complete turnaround from the many years that the game was almost totally dominated by Kingussie. Lovat, who courted relegation last season, confirmed third place in the Premiership with a 2-0 home win over Inveraray in their final game. Lorne MacKay scored in the first half and Ryan Ferguson in the second. The North Division 1 title, and the promotion to the Premiership which goes with it, have not yet been decided but Lochaber's 3-0 victory over their only challengers Skye at Spean Bridge leaves them needing just two points from their last four games to win the honour. However, with a massive goal advantage of 38, a single point will, in practice, do the job. Sean Nicholson's double was split by one from Scott Paterson. Beauly closed in on third place with a 3-2 home success over Inverness in a game where they rushed to a 3-0 lead within half an hour.